﻿ Riad Carina Marrakech. JIMAT di Agoda.com! Ada soalan mengenai Riad Carina? Menawarkan penginapan yang berkualiti tinggi di daerah siar-siar, budaya, beli-belah di Marrakech, Riad Carina merupakan pilihan popular untuk kedua-dua tujuan perniagaan dan percutian. Hotel ini tidak terlalu jauh dari pusat bandar: hanya sejauh 1.00 Km, dan kebiasaanya mengambil masa kira-kira 15 minit untuk sampai di lapangan terbang. Syurga untuk berehat dan bersantai, hotel ini akan menawarkan pembaharuan penuh hanya beberapa langkah dari pelbagai daya tarikan bandar seperti El Badi Palace, Istana Badi, Place des Ferblantiers. Riad Carina juga menawarkan banyak kemudahan untuk memperkayakan penginapan anda di Marrakech. Hotel ini menawarkan khidmat bilik 24 jam, Wi-Fi percuma semua bilik, meja depan 24 jam, daftar masuk/daftar keluar ekspres, simpanan bagasi untuk memastikan tetamu menikmati keselesaan yang terbaik. Semua bilik tetamu menawarkan pelbagai jenis tahap keselesaan. Banyak bilik turut menyediakan televisyen skrin rata, internet wayarles, kolam renang peribadi, internet wayarles (percuma), bilik larangan merokok untuk memuaskan hati tetamu. Senarai lengkap kemudahan rekreasi boleh didapati di hotel, termasuk rumah urut. Dengan lokasi yang ideal dan kemudahan sepadan, Riad Carina sangat memuaskan hati. From our collection at the airport (arrange by the riad carina) to the stay at the riad carina it was fab. Nothing is too much trouble for the staff in particular siad who waited on us every day and AZiza who cooked amazing tagines. This trip was on my sisters bucket list and it did not disappoint. I would not hesitate to recommend it. It would not be easy for anyone with a mobility problem as there are no lifts although I do believe there is a ground floor room. I had a lovely stay at Riad Carina. The service was excellent and nothing was too much trouble for the staff. 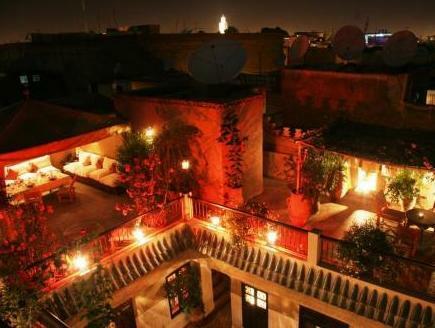 The Riad is located at the southern part of the Medina about 5-10 minutes walk from Djeema-el-Fna. The rooms were nicely appointed and clean. Recommended. This hotel is amazing value. Clean, quick walk to all the action of the Square, and reasonably priced. It's a riad, so you need to understand what you're getting and make sure it's what you want before booking. It's an old home with traditional and beautiful Moroccan features. Some rooms are very small but nicely appointed and decorated. It was very quiet even though it was fully booked. This isn't an appropriate set-up for the late night party crew or someone who can't handle stairs. There are also a lot of things that come with an older property that you should be willing to accept like plumbing that drains slower and hot water that doesn't last forever. If you need something more modern, pick a newer, more modern hotel. If having a quiet and more authentic experience Is for you then this is the right place. Staff are friendly, warm, and accommodating. They gladly met any of our requests. Breakfast is simple but satisfying (Moroccan pancakes, bread, croissants, jams and honey, coffee or tea). My stay at Riad Carina exceeded my expectation as I was thinking that I have chosen a simple budget type hotel with limited facility. But it was totally different than I thought. Welcomed with Moroccan smiles, mint teas and cookies, which was really refreshing. The room was so clean and nice with limited but quality bathroom amenity and comfortable bed. Staff was so helpful and cooperative. Really nice atmosphere inside and you feel like a paying guest with a host family. Certainly recommend to all if you are looking for cheap and best option. The location was great, very close to El Badi Palace (located behind the riad) and Bahia Palace (a few blocks). The main square (Jemaa-el-Fna) is only within walking distance where you can find all the attractions. 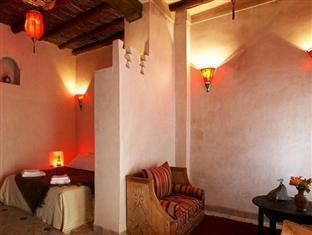 The main riad is really nice, but I stayed in the next riad, which was OK but the main was better. The internet in the next riad wasn't working when I stayed there, but I could always come to the main riad to use the internet. There was only one cleaning lady in the next riad and you have to go to the main riad to get all other services this riad offers. Not a problem for me, but my advice would be to provide the same services in the next riad like in the main riad. Overall, it was an enjoyable stay. I was just a bit disappointed that they put us in the riad next door, and not in the main riad. We had to carry around our own keys and we had an entirely separate entryway. It was a bit inconvenient and not what was advertised. they offer a cooking class, in which you can learn to cook a Moroccan supper. We would stay at this place next time we are in Marrakech. The room had A/C, which would be necessary in the summer. There is a nice roof terrace from which we counted 14 active pelican nests. 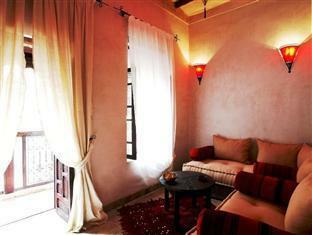 Very nice cosy Riad. Absolutely the place to stay. Good breakfast and service. Highly recommended although it. Great Riad close walk to the square. Very helpful staff and great breakfast. we made riad carina our home in marrakech while traveling this part of morocco. during our visits we stayed in three different rooms. all were clean and comfortable (though the room on the terrace needs some attention to the shower - it dies not drain well, the hot water tap is very difficult to turn, and the shower- head holder does not hold it at a good angle). not a major problem, but something the riad should fix. the staff at riad carina were very friendly. the day staff wedge great to help organize taxis, excursions, etc. siad, the night clerk was always friendly and accommodating. traditional moroccan breakfast was served each day, and the pancakes were delicious. it's a short walk to the action and it was nice to be a little removed from the bustle of marrakech. would stay there again. Best hotel experience ever. The staff was extremely helpful and friendly and the room and hotel itself was beautiful. Loved the mint tea and hookah. The location was convenient but cabbies won't necessarily know where it is. Das Riad Carina liegt etwas weg vom Rummel, in einer kleinen Seitengasse in der Nähe des Platzes mit den Eisenhandwerkern. Die Zimmer sind sauber, eher etwas klein, was aber nicht stört, da wir doch meistens auf Achse waren. Die Betreuung im Riad ist sehr freundlich, die Angestellten sind sehr hilfsbereit. Das Abendessen auf der Dachterrasse wurde durch klappernde Störche auf der gegenüberliegenden Mauer begleitet. Das Riad Carina ist empfehlenswert. Alles bestens, gerne wieder. Toller Aufenthalt als Einstieg für eine Marokko Rundreise. Einfach spitze!Besonders freundlich waren Meriam und Said vom Bedienungspersonal. Nichts war ihnen zuviel. Immer freundlich und aufgestellt! Das Zimmer war sehr hübsch eingerichtet! Das Frühstück schmeckte uns sehr gut! Wir waren sehr gern im Riad Carina. Allerdings sollte man bedenken, dass Zimmer in Riads häufig keine Fenster mit Tageslicht haben. Wir hatten erfreulicherweise das Zimmer auf der Dachterrasse. Nette Menschen, guter Service! Veramente e semplicemente una splendida esperienza. Io e mia moglie eravamo alloggiati nell'unica stanza con accesso dal terrazzo che utilizzavamo come fosse una pertinenza della nostra stanza. Dal terrazzo si vedevano le cicogne che, al tramonto accompagnate da colori bellissimi del cielo, richiamavano il proprio compagno/compagna. Spledida permanenza, raccomandato. Il personale è stato gentilissimo, ci hanno fornito tutte le informazioni richieste. Il Riad è a 8 minuti a piedi dalla piazza centrale di Marrakech in una zona molto silenziosa. Le camere sono molto pulite, adeguatamente spaziose e con bagni di giusta dimensione. Tutte arredate con gusto. La terrazza è magnifica! La colazione abbondante e particolare. Kleinschalig, zeer sfeervol riad met prachtig dakterras. Uitkijk op de ooievaarsnesten op de oude stadsmuur.Op loopafstand van verschillende toeristische bezienswaardigheden. Goed ontbijt en zelf je traditioneel marrokaans diner koken behoort ook tot de mogelijkheden. Echt een aanrader.